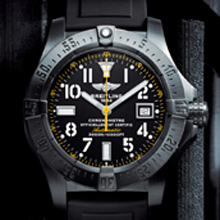 echoing Breitling aeronautical vocation – and by a rubber strap. Inside this allblack super-diving model beats a mechanical selfwinding movement that is officially chronometer-certified – like all Breitling movements. Avenger Seawolf Blacksteel Code Yellow: power in action. selfwinding, high-frequency (28,800 vph), 25 jewels. Calendar. Case: black steel,1,000-piece limited series. Water-resistant to 3,000 m (10,000 ft)/300 bars. Screwlocked crown. Unidirectional ratcheted rotating bezel. Cambered sapphire crystal, glareproofed on both sides.